More flexibility, fewer downpipes, and easy rainwater routing – a low-maintenance, eco-friendlier system. Conventional drainage operates by flowing when part full, and consists of a simple hole, placed in the lowest area of the roof. The syphonic solution is completely different, in that it functions at full capacity by syphoning water from the roof at high speed, and requires fewer roof outlets. The innovative system operates using an anti-vortex plate, which when full, shuts off air-flow to the downpipe. This, combined with gravity’s natural pull, creates a vacuum – sending the rainwater down the collector pipe. Once at the ground, the water is then diverted into a manhole, recycling collection tank or inspection chamber, and then onwards into the storm sewer. High velocity drainage means that far fewer downpipes are needed, saving money in both material costs and additional groundwork. It’s easy to divert rainwater to specific collection tanks, which can then be reused for irrigation or sanitation. Because it requires fewer downpipes, the siphonic system is far quicker to install, reducing construction time by a significant margin. 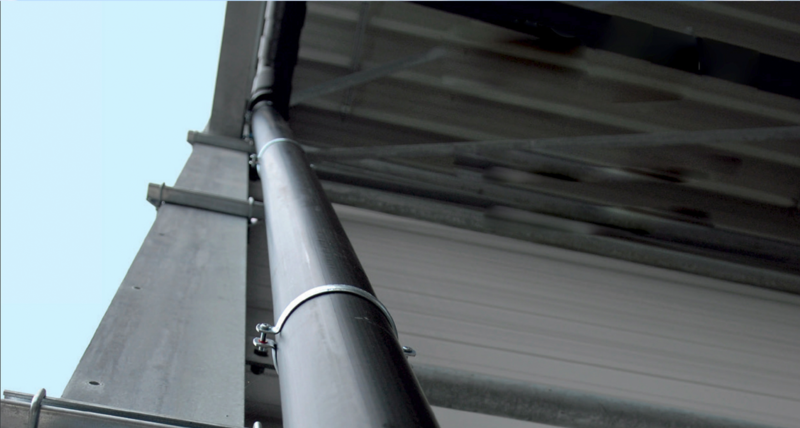 The system requires far fewer downpipes, and the location of the downpipe discharge is completely flexible, which provides architects with greater freedom in terms of placement. Most designers choose to position the downpipes internally within the buildings, which improves overall appearance. Unlike conventional drainage systems, the syphonic system’s rainwater pipes are able to drain when completely full of water, at high speed. This boosts capacity considerably. In the 21st century, it’s more important than ever for businesses to show their green credentials. This innovative system means that rainwater can easily be directed to specific collection tanks, and reused at a later date. Due to the way in which siphonic systems function, pipes can be made with a narrower diameter, which reduces the space required to fit them. The siphonic drainage solution allows for a high degree of flexibility, making it easy to tailor to meet your requirements. It’s also far quicker to install, because of the reduced materials involved. The way the pipes are installed above ground means there’s less underground drainage, trenching, soil removal or treatment of backfill.